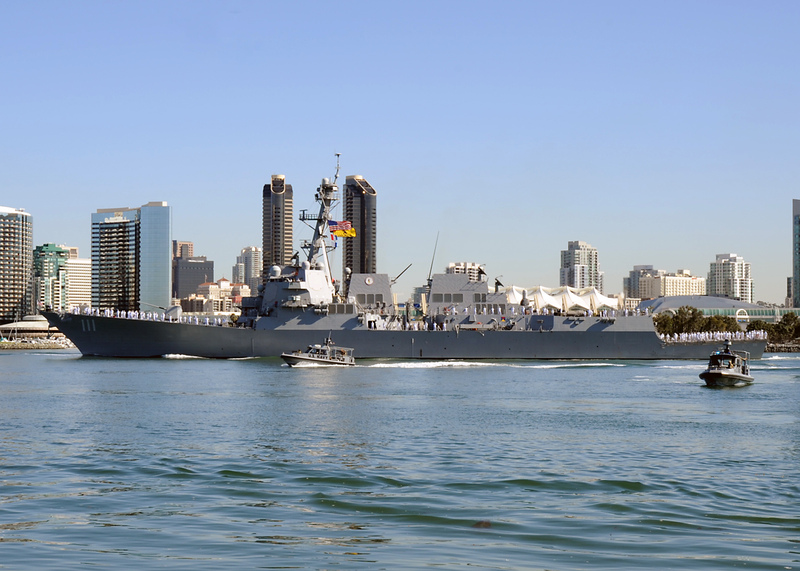 The guided missile cruiser USS Cowpens and the guided missile destroyer USS Spruance returned to Naval Base San Diego Thursday from separate deployments to the Western Pacific. The 567-foot Cowpens and its crew of 400 deployed in September. In November, it provided humanitarian help in the Philippines following Super Typhoon Haiyan. Nicknamed the “Mighty Moo,” Cowpens is named after the American Revolutionary War battle fought on Jan. 17, 1781, at the “Cowpens” in South Carolina. During the battle, American soldiers defeated a much superior force of British soldiers, giving the American Army the confidence to pursue the British from South Carolina to Yorktown, Va. 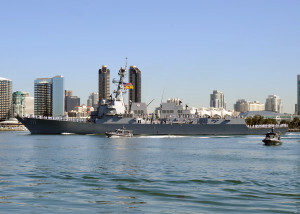 The Spruance and its crew of 260 officers and enlisted personnel left San Diego in October for its maiden deployment and spent the time supporting security and stability in the Indo-Asia-Pacific region. Commissioned more than two years ago, the 509-foot ship is named after Adm. Raymond Spruance, a cruiser division commander who substituted for the ill Adm. William “Bill” Halsey to lead an aircraft carrier task force at the Battle of Midway during World War II. Spruance and Halsey went on to split command of the Navy’s prime carrier strike force in the Pacific in later battles against the Japanese. Spruance later succeeded Adm. Chester Nimitz as the commander of the Pacific Fleet, led the Naval War College and was the U.S. ambassador to the Philippines. He died in 1969 in Pebble Beach. Separately, the Navy announced that the new amphibious transport dock ship USS Somerset will arrive at its home port of San Diego on Monday. The ninth vessel of its class was commissioned March 1 in Philadelphia. Somerset is named in honor of the crew and passengers of United Airlines Flight 93, which crashed near Shanksville, Pa., in Somerset County during the 9/11 terrorist attacks. It is the third of three amphibious transport dock ships named to honor victims and first responders, following the USS New York and USS Arlington.